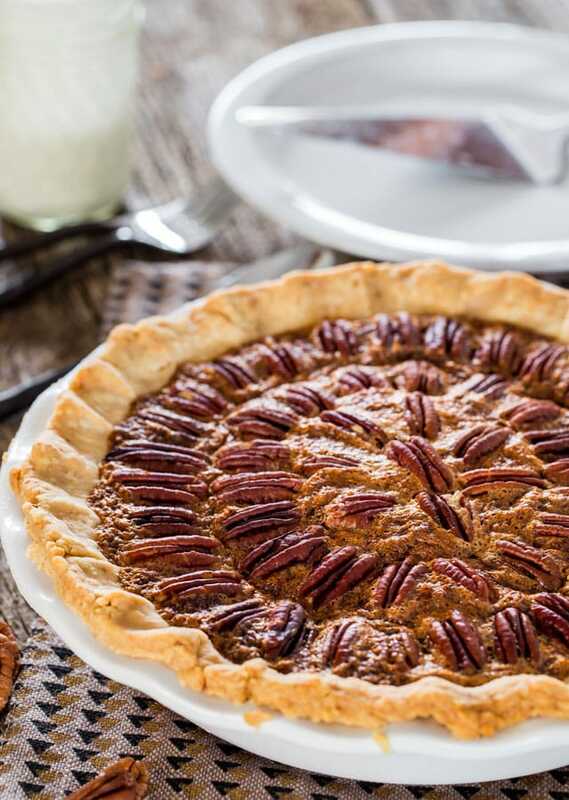 Bourbon Pecan Pie – a homemade classic pecan pie spiked with a little bourbon. 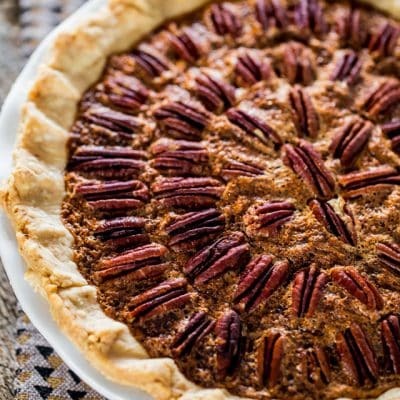 A decadent, rich and delicious pecan pie, the perfect dessert for your Thanksgiving dinner. One of our favorite pies, if not our favorite pie is pecan pie. And this pecan pie is special, and I say special because it’s spiked with some booze, bourbon specifically. You know that anytime you spike anything up with bourbon, it’s going to be good. But anyway with Thanksgiving less than a month away, it’s time for some pecan pie! Now when you look at this recipe and see all the brown sugar and corn syrup you’re probably going to say oh hell no. But it’s for Thanksgiving, people, I’m sure you’re not counting calories during Thanksgiving dinner, so this is one of those indulgences you make once or twice a year. Not only that, but this is probably not going to be the most fattening thing you’ll eat at your Thanksgiving dinner, or maybe it will be, what do I know. Don’t care though. Because this pecan pie is about satisfaction, pure indulgence. But how do we make this decadent morsel? The pie crust is my trusted recipe for pie crust that I make every single time I make any type of pie. It’s really simple to make and very flaky and buttery. 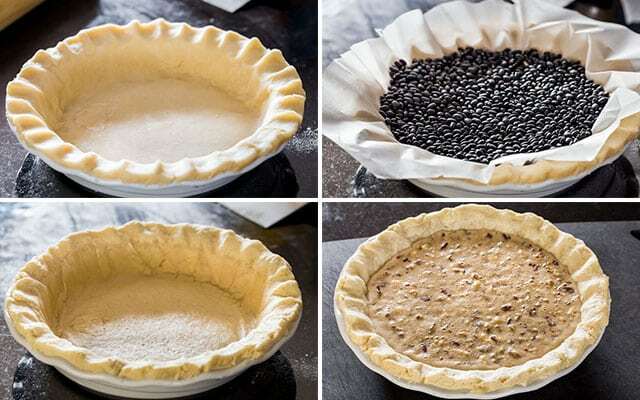 You do have to bake it first, and I recommend putting a piece of parchment paper over the crust and filling it with pie weights or if you don’t have any, use some dry beans just like I did. Bake it like that for 15 minutes. The pie filling is where things get interesting. Eggs, brown sugar, corn syrup, pecans as the main ingredients and of course let’s not forget the bourbon! You don’t need a lot, I just added a tablespoon of bourbon but it’s enough to flavor the filling nicely. Then if you want to get fancy you can arrange the rest of the pecans nicely over the filling, it doesn’t take that long and it’s looks so purrty! Then all you have to do is bake the pie for about 50 to 55 minutes, until golden brown and if you jiggle it there’s no more wiggle. You have to let the pie cool completely before slicing into it, tough job but you have to do it. Then there’s one more step you have to do before you eat. You must make the bourbon whipped cream which is so good and so boozy, you’ll love it and it will go wonderfully over the bourbon pecan pie. Trust me. 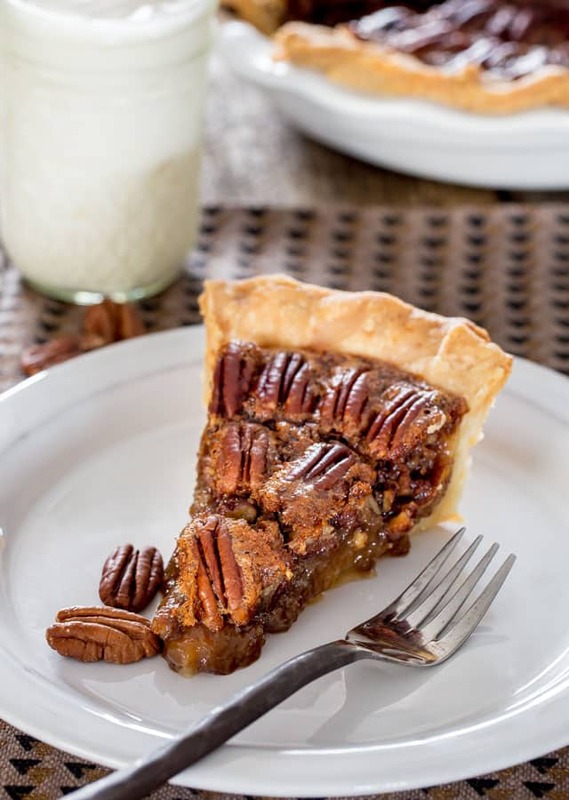 Bourbon Pecan Pie - a homemade classic pecan pie spiked with a little bourbon. 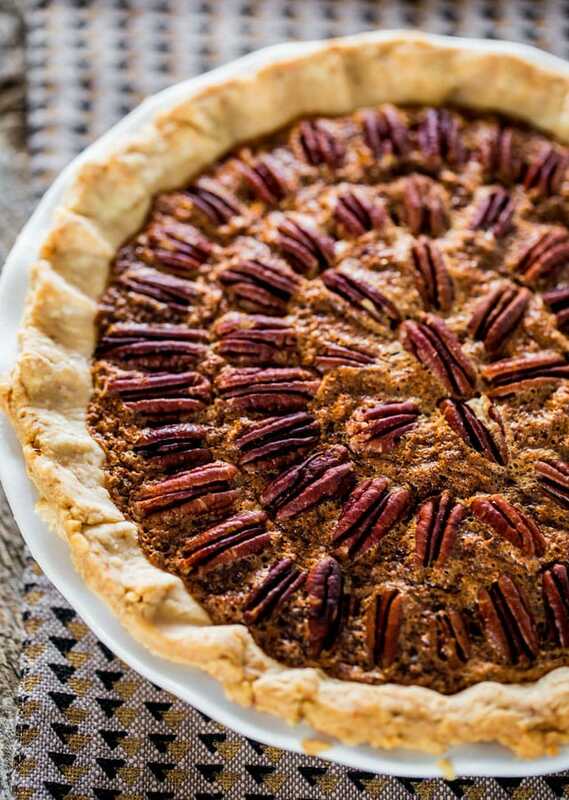 A decadent, rich and delicious pecan pie, the perfect dessert for your Thanksgiving dinner. Place the butter in the freezer for 20 minutes. Add the flour, salt and sugar to a food processor and pulse a couple times. Add the butter to the food processor and pulse for about 30 seconds to a minute until the mixture resembles peas. Add the ice water one tablespoon at a time and continue pulsing. The dough should start to hold together. Remove the dough from the food processor and place it over your working surface. Form the dough into a flat disc, cover in plastic wrap and refrigerate for at least 30 minutes up to 2 days before using. Spread the pecans evenly on a baking sheet and place them in the oven. Toast the pecans for about 5 minutes, but as soon as you smell them, take them out. In the meantime, take out the dough from the fridge, if you've left it in the refrigerator longer than 30 minutes take it out 15 minutes before using so that it becomes malleable, and roll it out so that it's about 14 to 15 inches in diameter. Place and arrange the dough into a 9" pie plate and pinch the dough between thumb and forefinger to crimp the edge of the pie crust. Place a piece of parchment paper, that's bigger than the surface of the pie and place it over the dough. Add pie weights or dry beans on top of the parchment paper, and bake for about 15 minutes. In the meantime make the filling. Take about half of the toasted pecans and chop roughly. Add the eggs and brown sugar to the bowl of your mixer and mix those together for a minute. Add the corn syrup, melted butter, salt, orange zest and bourbon to the mixer and mix for another minute until everything is well incorporated. Stir in the chopped pecans. Once the pie crust is done, carefully remove the weights from the crust by pulling up the ends of the parchment paper. If you're using dry beans don't throw them out, reuse them next time you're making pie. Let the pie crust cool slightly, for about 5 minutes. Pour the pie filling over the pie crust and arrange the rest of the toasted pecans over the top of the pie filling. Place in the oven and bake for about 50 to 55 minutes, until it puffs up and if you jiggle it there's no wiggle to it. In the meantime make the bourbon whipped cream by adding the whipping cream, icing sugar and bourbon to the bowl of your mixer and mix until soft peaks form. Let the pie cool completely before slicing into it. Serve with a dollop of the bourbon whipped cream. See more information for making the pie crust, including tip, tricks and how to video on the pie crust recipe post. 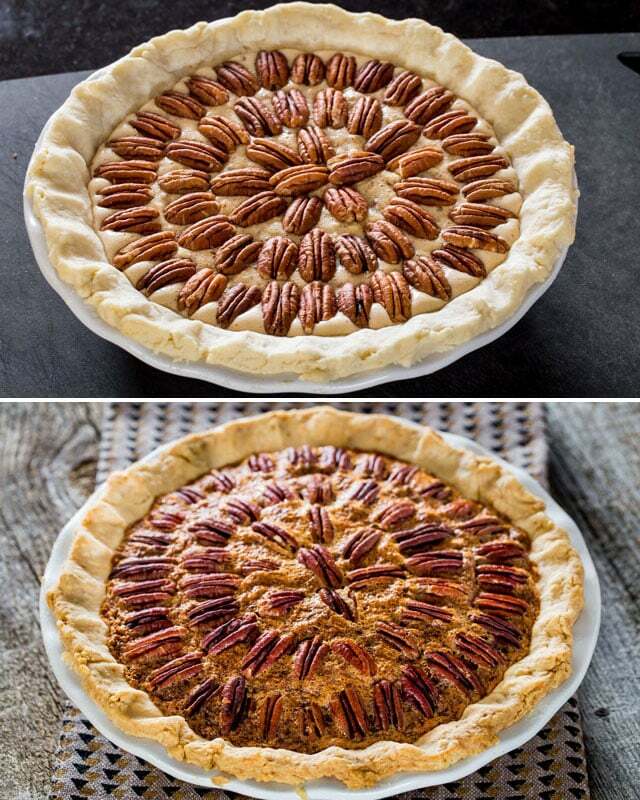 I would love to make this pie, but would like to know how much Pecans it calls for, I do believe you forgot to put the Pecans in the recipe… is there any other ingredient missing? The pecans were listed in the wrong spot- we’ve moved them! This pie looks beautiful AND delicious! 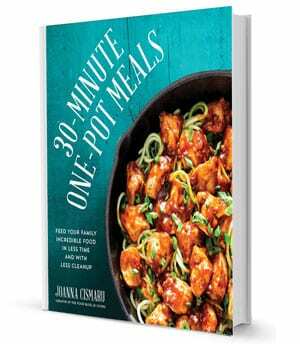 I’ll be adding this to my Thanksgiving menu for sure! Add 1/2 cup semi-sweet chocolate chips and you will have a perfect Kentucky Derby pie. If I think of it ahead of time, I soak the pecans at least overnight in Bourbon. However, if you do this, use fresh Bourbon in the pie. The liquid you soaked the nuts in has changed flavor. You had me at bourbon! Thanks Jo I’m going to give this pie a try. I’m sure mine won’t look as beautiful.